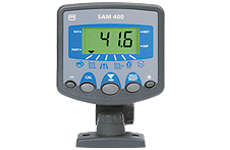 The RDS SAM 400 allows for more accurate fieldwork and the acquisition of information relevant to invoice charging. More accurate fieldwork and acquisition of information relevant to invoice charging. Two programmable forward speed alarms operating two outputs may be utilised to control unspecified aspects of machine operation. Forward Speed (km/hr or miles/hr) with two programmable forward speed alarms and distance channel (km/miles). Instantaneous Work Rate and engine hours. Water and weatherproof construction – suitable for vehicles without cabs.